Blood Lunar Eclipse-2018 image spotted somewhere in Bosphorus region,Turkey. Everything you need to know about Friday’s total lunar eclipse, from how to see it wherever you are in the world to why the moon turns red. Weather permitting, get ready for a beautiful celestial sight on Friday 27 July and Saturday 28 July, when a total lunar eclipse will be visible from almost all parts of the world. The only people missing out this time are Greenland, Canada and the USA. From the UK, this spectacular sight will last all evening. As the moon rises at 8:50pm, the eclipse will already be in its total phase and the moon will be a deep-red colour as it climbs into the sky. All you need is a clear view of the night sky. Your eyes are the best instrument to soak up the sight. If you happen to have a pair of binoculars to hand you can use them to range across the craters of the moon but that’s just icing on the cake. Best of all, you don’t need to wear special filters or protective glasses to view a lunar eclipse. Unlike a total solar eclipse, where it is dangerous to look at the sun, the moon never gets bright enough to cause a danger to your eyes. So, pull up a garden chair, invite some friends round, and as you watch the serene eclipse unfold, here are some fun facts to ponder. Where lunar eclipse will visible for viewing? The best view of the eclipse will be from east Africa, the Middle East, across to India and the westernmost tip of China. But there still be reasonable views for people in the rest of Africa, Europe, other parts of Asia, Australia and the eastern tip of South America. North America and Greenland look to be the only places that will miss out entirely. In Australia, the moon will start getting red at 4.30am AEST on Saturday morning, with the total eclipse occurring between 5.30 and 6.30am, before the moon sets at 6.55am. The moon will be close to the horizon, so make sure to look west-south-west. In the UK, the partial eclipse will begin at 8:30pm, the total eclipse will occur between 9.20pm BST on Friday, with the moon visible to the south-east until 10.13pm. 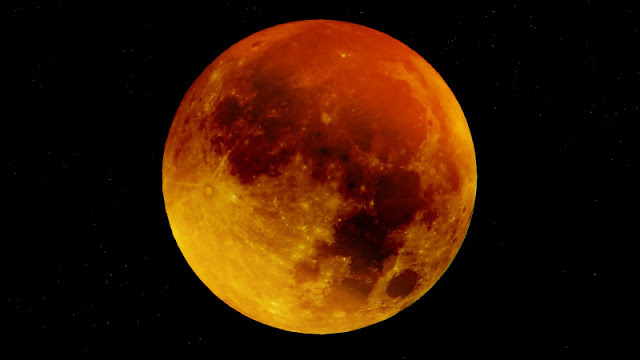 In east Africa, the partial eclipse will begin at 9.30pm EAT, with the moon completely red between 10.30pm and 12.13am. This region will have one of the best views of the eclipse. In India, the total eclipse will begin at 1am IST, finishing at 2.43am. A total lunar eclipse happens when the sun, Earth and the moon perfectly line up. The most spectacular part about a total lunar eclipse is that when the moon is fully in Earth’s shadow it turns red. This has earned the phenomenon the nickname of blood moon. A total lunar eclipse happens when the sun, Earth and the moon perfectly line up. The most spectacular part about a total lunar eclipse is that when the moon is fully in Earth’s shadow it turns red. This has earned the phenomenon the nickname of blood moon. The red colour happens because sunlight is deflected through Earth’s atmosphere. The process is called refraction and it bends red light from the sun like a lens into the space behind Earth – and so on to the surface of the eclipsed moon. The precise colour of the moon depends on the atmospheric conditions in Earth’s atmosphere. The clearer the atmosphere, the brighter and lighter the red colour appears to be. If Earth had no atmosphere then the totally eclipsed moon would be black. As it is, we stay alive because we have air to breathe and as a bonus we get a beautiful celestial phenomenon to watch. So, a win-win. How did lunar eclipse save Christopher Columbus? On Columbus’s fourth voyage, his ships ran into a storm that led to him becoming stranded on Jamaica. After beaching his two remaining ships (he started out with four) in June 1503, he and his crew threw themselves on the mercy of the local inhabitants. Accounts vary but clearly by February the following year, relationships had soured between Columbus’s castaways and the indigenous people. In order to continue to receive food and hospitality from the locals, Columbus needed to do some persuading, and he turned to his astronomical almanac for help. Spotting an upcoming total lunar eclipse, he is said to have gathered the locals on the evening of 29 February 1504 and told them his god was angry with their decision and had decided to project his wrath on to the moon. According to the story, when the blood moon appeared, the locals panicked and gave Columbus all the provisions he could want. Unlike the rather stately twilight that normally takes place on the moon, where a day lasts for about a fortnight and is followed by an equally long night, the sun’s light and heat disappear within minutes during a total lunar eclipse. Rather like plunging non-toughened glass from the oven into a bowl of cold water, this sudden change of temperature could cause the lunar rocks to crack and gasses to be released. These would help to supply the very thin lunar atmosphere, which is so rarefied it is called an exosphere. There is also another mystery to be explained. When astronomers take thermal images of the totally eclipsed moon, they see hot spots that they cannot fully explain.